Kids’ oral care accessories are typically garish and emblazoned with annoying characters—although there’s (a bit) more to the toothbrush design than just marketing manipulation. 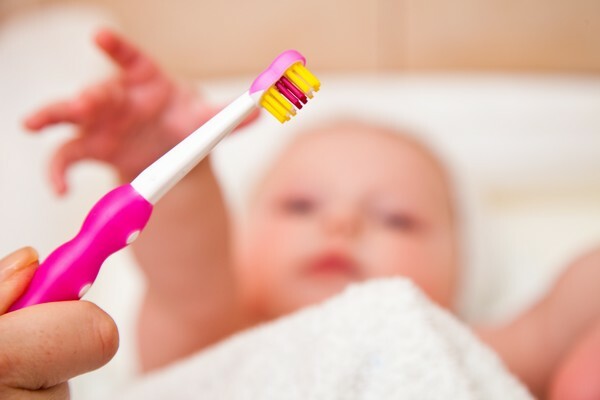 Depending on your tot’s age, his toothbrush will graduate in size accordingly; but have you noticed that the little circles of colour on the bristles go up in size, too? The reason, apparently, is not down to symmetry—the coloured bristles are in fact ‘toothpaste indicators’, showing exactly how much paste is appropriate for your toddler. Mum of two Holly Benn recently posted her newly discovered ‘hack’ on Facebook-– the post to date being shared more than 5,000 times by parents. (You’d think they’d found Willy Wonka’s golden ticket—such is the mundanity of parenthood). “Surely it depends on what toothpaste you use? They all have different strengths and stuff in them. As long as child doesn’t swallow toothpaste it won’t matter how much is on the brush surely?,” asks one doubtful mum. Did you know this hidden little hack? What are the Signs of Pre-eclampsia?BLW Coconut Chicken Curry!